The first 2011 Mustang Dyno Results are showing some very impressive horsepower numbers for both the new Coyote 5.0 liter V8 and the other all new, 3.7 liter Mustang V6 engine. Although driving impressions were embargoed, it hasn't held back getting some early 2011 Mustang Dyno Results. And what these dyno numbers look like for both engines are surprising. 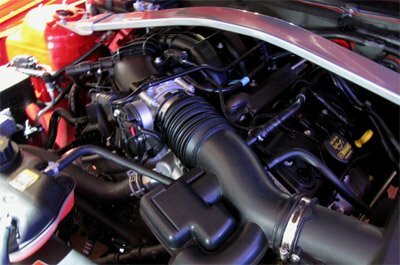 The specs for Ford's new Coyote V8, promise 412 brake horsepower at 6500 rpm, with 390 pounds of torque at 4,250 rpm. Figuring in typical losses from friction of about 15%, you could expect rear wheel horsepower at something like 350 hp. But new dyno tests for the 2011 Ford Mustang are showing different numbers. Bigger numbers. The output I've seen so far are running at levels from 378 horsepower to almost 395 horsepower. Running these Coyote V8 dyno numbers backwards, shows that while posted output is 412 horsepower, the actual horsepower is in the range of 435 to 455 horsepower! The new 3.7 liter V6 engine seems to be delivering a bit more for the money as well. Dynos on the new V6, which employs new cylinder surface technology (unlike the ecotec V6) is seeing improved dyno horsepower figures as well. While not as impressive a change compared to the coyote engine, the new V6 is pulling around 268 horsepwer at the rear wheels, which equates to approximately 308 horsepower, with torque peaking earlier at 4,000 rpm, compared to the factory's specs showing 4,250. On the ground, this should equate to very solid passing power and yet an astounding 31 mpg fuel economy on the highway. Whether you are a solid rear axle purist, or an independent rear suspension advocate, rear wheel horsepower output remains a function of losses due to friction. From a pure horsepower perspective, having a live rear axle on the 2011 Mustang means slightly more power gets to the wheels. Tires, traction, front to rear weight bias and a host of other factors dictates whether you can transfer that power to the ground. Here's looking forward to seeing real world results at your local drag strip and road courses in the very near future. 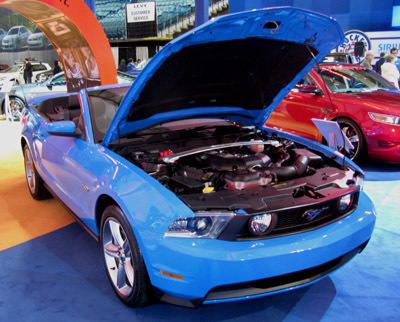 The pictures above, are fresh from the 2010 Vancouver Auto Show. Check out the rest of the new Mustang Pictures and new information from the 2010 Vancouver Auto Show here.